As you may know, Bing and Yahoo form a conglomeration in the search field and are powered by the same search algorithms. However, even though they use the same technology they don’t produce identical search results. You can use this to your advantage to find new keywords. Search for general keywords in Bing and Yahoo to see keywords they recommend. My only guess to why Yahoo is skimpy with the suggestions is because search is not their main product. They concentrate most of their efforts on aggregating news from across the globe and concentrate on search as a second option. Did you know that there are web companies that provide lists of popular keywords? My advice is to observe as many of them as possible for potential lucrative niches. However, don’t instantly jump on a keyword just because the site says so, I would recommend understanding how they estimate the keyword popularity, and to cross reference with keyword planner. Note, its bad marketing to observe the most popular keywords for a particular day as popularity can be greatly influenced by news. My advice is to observe the keywords over a set duration of time and then analyze the keywords to see if you can find keywords that are NOT trends as trends are more than likely short termed. 1. AOL : Use AOL for keyword research. AOL was popular in the mid nineties but as the seo wars continued it became less relevant in the seo realm. When you search for a keyword in AOL it provides 10 related searches by default, and many of them are unique keywords. I like using several search engines to cross reference each other to get as comprehensive data as possible. AOL and Google contains 1/18 similar keywords or roughly 5.56% similarity so you definitely can find some solid keywords by plugging in general keywords into Google. For example, a new solid keyword that was suggested to me by AOL was “internet business.” So know I have compiled a couple of big keywords in my list. I can then plug in this new keyword into Google, Bing, and Yahoo to see if I can find any new potentially lucrative keywords. I feel that AOL definitely has the simplest interface for viewing daily popular keywords. It doesn’t have all the bells and whistles like Google trends does but if popular searches in AOL is all you want then this is what you’ll get. According to my research I couldn’t find any archives of popular searches which is shame so this will have to do for now. They list the daily and hourly 50 most searched keywords. 2. Dogpile : This is actually a meta search engine which suppose to aggregate results from several search engines like Google and Yahoo. That’s why if you were to compare the search results of Google to Dogpile you will notice that Dogpile is considerably slower as Dogpile has to pull results from Google and Yahoo. In addition, where Google provides 8 results by default Dogpile provides 10 results by default. The primary reason I use Dogpile is because it saves a lot of time when mining the search engines. You know that when you’re using Dogpile you will get an overlap of search results from the top search engines which save a lot of time. In addition, Dogpile will provide different related searches when you enter a query. Compared to Google it contains 4/16 similar words, or 25% similarity. This is an indicator that it’s definitely worth your time to use Dogpile for finding more keywords that you wouldn’t have discovered in the major search engines. In addition to finding major keywords you’ll most likely find new urls on pages 1-5 on Dogpile that you wouldn’t have found in the major search engines which is excellent for finding new linking opportunities. 3. Excite: This was one of the most popular internet brands in the 90s but as of 2014 its knot known by casual web users and is also powered by Dogpile. 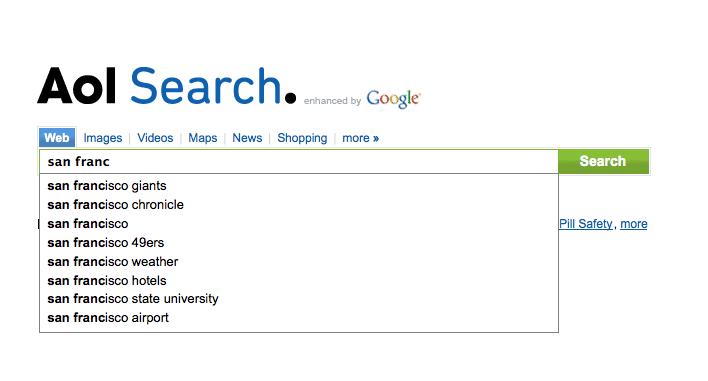 To use this search engine simply visit the url here: www.excite.com/. You will notice that the homepage still looks like something from the 90s and that when you query for searches it will take longer than if you were to use Google. As you can see they provide 16 related keywords which is double the amount Google provides. I have no doubt that you will be able to use excite to find additional keywords to target. Posted on December 8, 2015 by Christopher Cofer. This entry was posted in Affiliate Marketing, Internet Marketing, SEO and tagged AOL for keyword research, find new keywords, general keywords in Bing, keyword popularity, lists of popular keywords, search algorithms, search for a keyword in AOL, the most popular keywords. Bookmark the permalink.